Wrinkled hands w/ chipped and discolored fingernails. Ah, Emperor Palpatine, that most charismatic of rulers whose priorities just never quite, erm, aligned with what any of us would consider moral or ethical or good or just or kind. A widely recognized popular culture symbol of evil, sinister deception, dictatorship, tyranny, and the subversion of democracy since the original trilogy but cemented as such since, we remember him specifically for being an awful force for twisting democracy by the wayside in the favor of his own power. What a jerk! Often, the unspoken competition among all of us on Halloween remains who can whip up the most unsettling, disturbing, and evil costume—and if you've chosen Emperor Palpatine as your source material, well, good start. 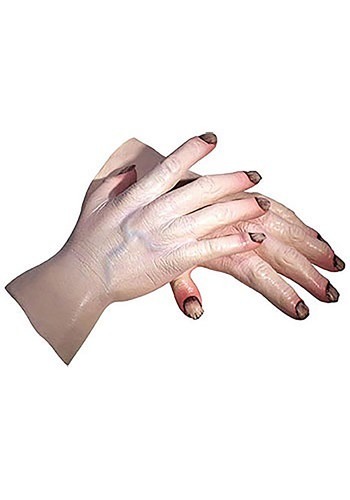 These latex gloves will help you slip into his skin, flicker your dastardly yellow eyes at unsuspecting Jedi youth, and rub your wrinkled hands together as you contemplate your next power grab. You know you want to buy them. Go ahead, do it. Do it.